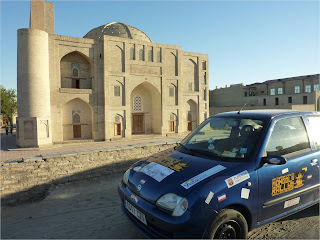 Driving 13.420 km, through 17 countries in a tiny car. START ON JULY 13TH!! As promised in our last post, here is the release of our last video giving you a glimpse of how it is like to drive through Mongolia from west to east. 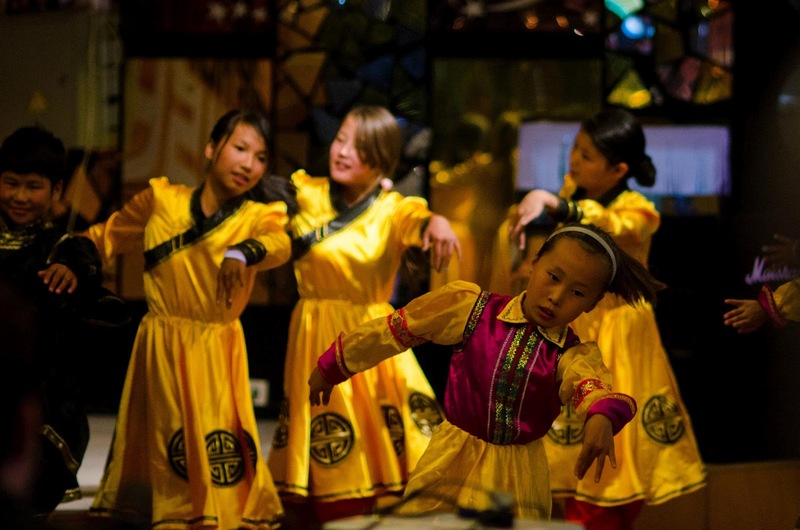 It has certainly not been easy, but it has been very rewarding, especially when we met the children from the Lotus Centre in Ulaan Baatar. In our final post we will annouce how much money we raised for the NGO and the children. By then our little blue beast will have been sold through the auction which will come on top of the donations (expected to sell for double the price we paid for it...even after crossing 1/3 of the planet!). So here it is...We present to you the very last video of our adventure: Enjoy! 13.320 km - We made it!!! 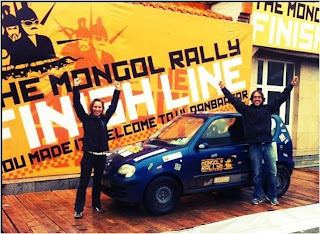 After 5 intense days through the rough Mongolian terrain, we finally made it to Ulaan Baatar! 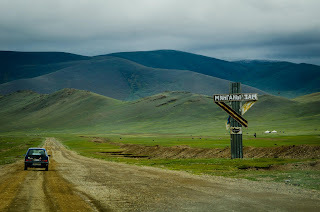 It has been an amazing experience straight from the moment we crossed the Mongolian border (and the paved road stops literally straight after the fence!) 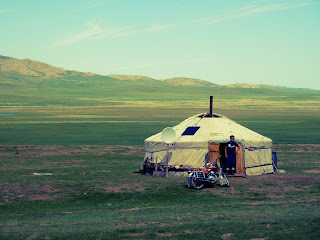 up until Ulaan Baatar. Days of driving over impossible dirt paths, crossing wild rivers, sand dunes, swamps, suffering sand storms, rain and freezing temperatures at night... everything with our tiny blue beast. 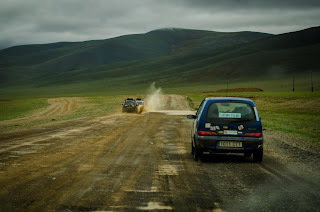 Many stories to tell which can not be captured in one post, but hopefully the final video will give you a sneak preview of what Mongolia is like and how it feels to cross the full country from west to east in a small Fiat Seiciento. The video release will follow soon, so stay tuned! 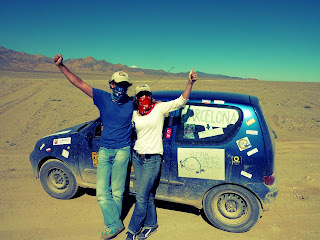 After crossing 15 countries, we are ready for the last one. It will be days with no roads, no water, no electricity, no communications... and no shower. We are ready to go into the wild. We are ready to face the ultimate challenge: Mongolia! This will be our last post until we reach Ulaan Bator. We hope to send you new signs of life in one week. But if you have not heard from us in two weeks time... Help!! 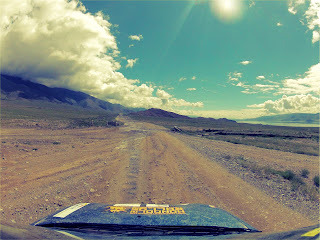 The longest drive through a single country that we have done so far has been in Kazakhstan. 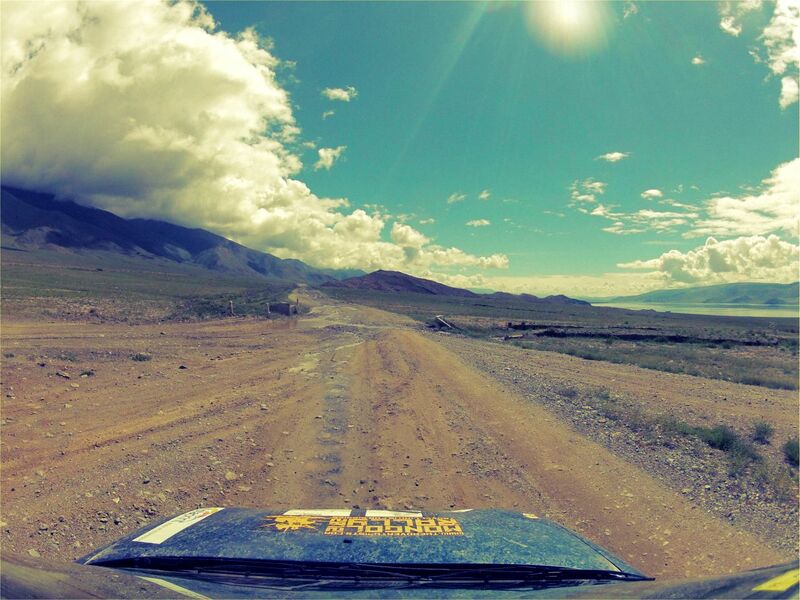 With a surface 66 times bigger than the Netherlands, the Kazak-roads proved to be a test to our resistance. However, after 3 days driving 14 hours a day, we made it to the border of Russia. Border crossing in Kazakhstan. In the pic Sil, the Border Police boss and our little friend Tazz. The border did not take long this time, only from 11.00 to 16.00. Not bad taking into account that they had an hour lunch break (they went for lunch from 12.00 to 13.00 and left us there alone and waiting in the sun). 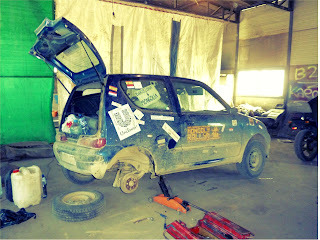 1, The “blue beast” got hurt in the belly by a rock. 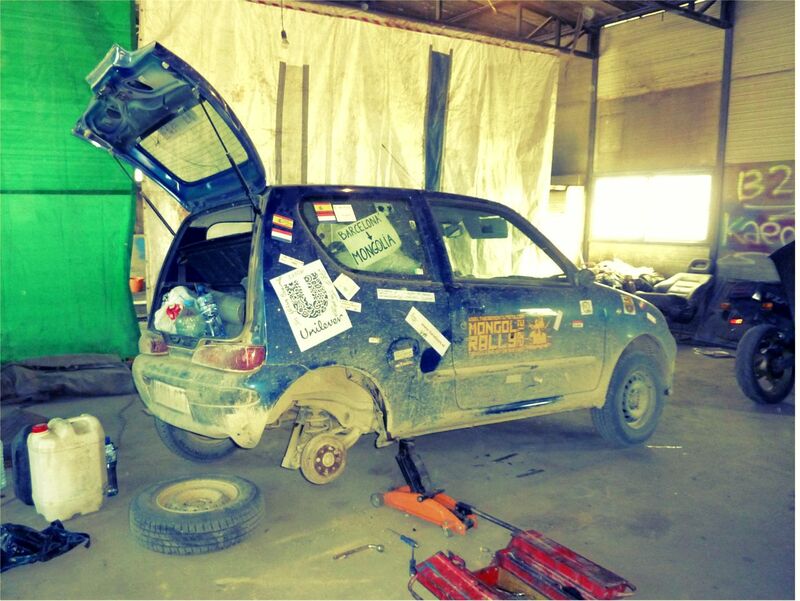 We went to the doctor (mechanic) and confirmed us that he was okay. Just a bit of stomach ache. 3. The biggest bill is 1.000 som (local currency), which is around 0,3 cents of euro. It´s a nice feeling to change a hundred euros in som and get around 350 bills which do not fit in the wallet! We feel like being rich! 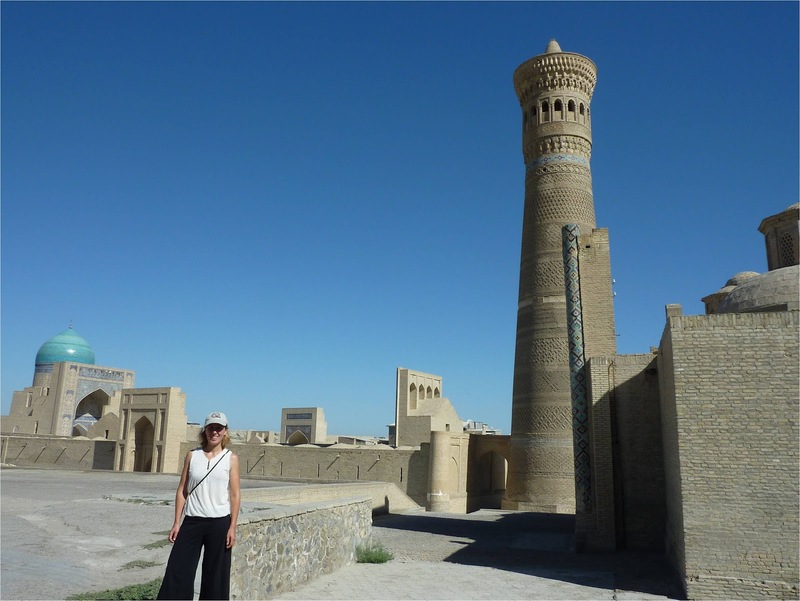 We never really thought about how infrastructure can increase people´s flexibility so much, until we started to hit the road in Turkmenistan. The roads are existent, but that is as much as you can say about it. Putholes everywhere so we were only able to reach a top speed of 50 km/h…making the whole trip from Turkmenbasy to Ashgabat of 500km rather bumpy, long and painful. 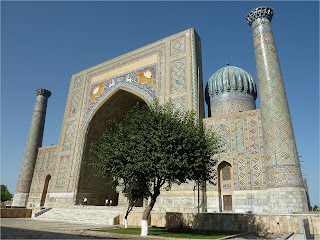 When we finally reached Ashgabat we realised that all the money (Turkmenistan is a country rich of oil and gas) is invested in building marble palaces in Ashgabat (the capital) instead of improving the infrastructure. Even though we arrived late to Ashgabat due to the worst road conditions we have ever seen, we decided to continue driving to the "Gate to Hell", a must-see when you are in Turkmenistan! 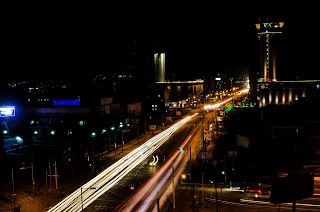 So we found ourselves in the middle of the night on a bumpy road looking for a red light at the horizon of the sky. 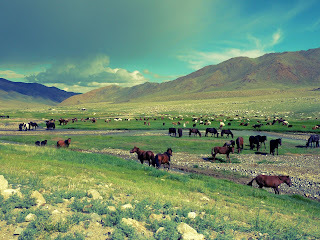 As it was getting later and later and we realized that we would not be able to find it, we decided to camp somewhere close to the road. As we turned into what seemed to look like a road, we realized we actually drove straight into the desert and got stuck in the soft sand after 3 meters. This was going to be a loooong night. While we were trying to get the car out of the sand at 2 am a car with a Turkmen family stopped and offered to help us out. This was our first encounter with Turkmen hospitality. When we finally managed to get out and more or less explained that we were looking for the gas crater, they indicated we should follow their friends car. One hour later we ended up at a bar in the middle of the desert waiting for a jeep to bring us to the gas crater. An unbelievable and surreal experience, but we made it in the end and it was unforgettable. Check the video and judge for yourself! The longest border crossing ever: 48 hours! 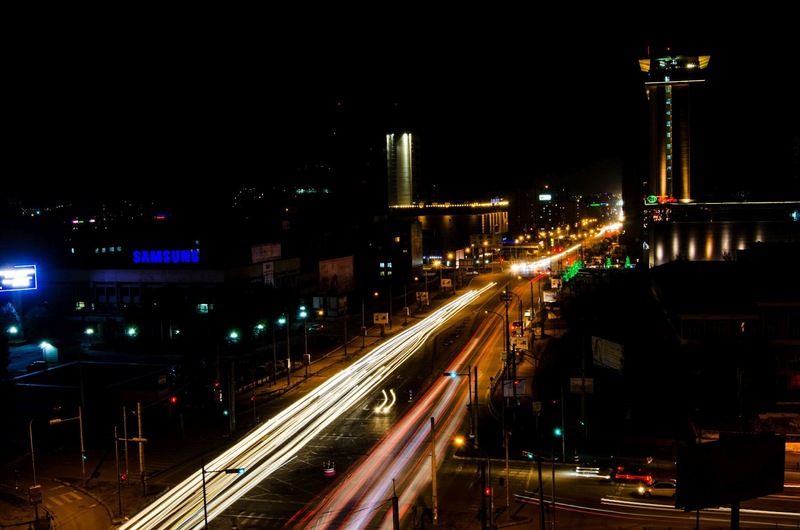 After driving 12 hours through crazy Azerbaijan, we made it at night to Baku. 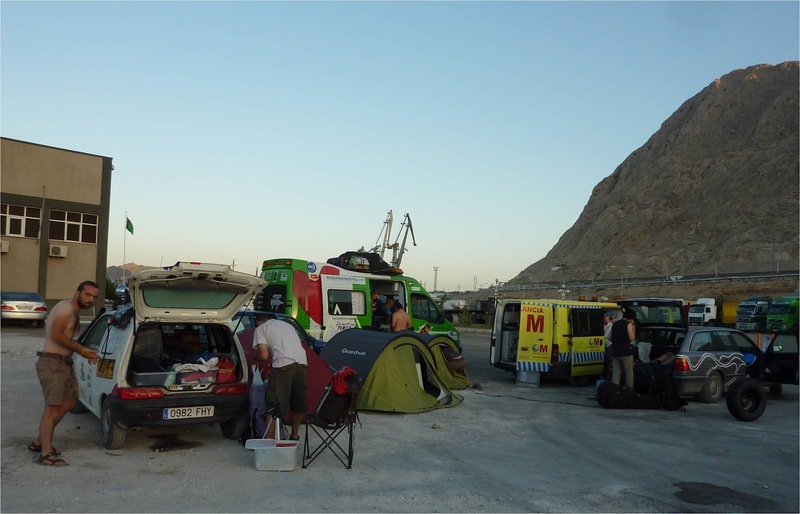 The next morning we were supposed to go from Baku (Azerbaijan) to Turkmenbashi (Turkmenistan) in a cargo ship via the Caspian Sea. This was no easy task because there was no information at all of how to do it and nobody seemed to know anything either. We heard it was possible though, and we were decided to try!! July 24th - 08.00 – 11.00: Where is the harbour? The first thing we had to found out was where the harbor actually was located. Nobody in Baku knows from where the cargo ships to Turkmenistan depart. There is nothing on the internet either, except for rumors and contradictionary blogs. So, after driving for 3 hours around the city, asking various people on the street with hands and legs (our Russian is improving by the day though!) we finally found the dock of our cargo ship....and with it a group of 15 other Mongol ralliers waiting patiently… for days! July 24th - 11.00 – 18.00: Can we get in? 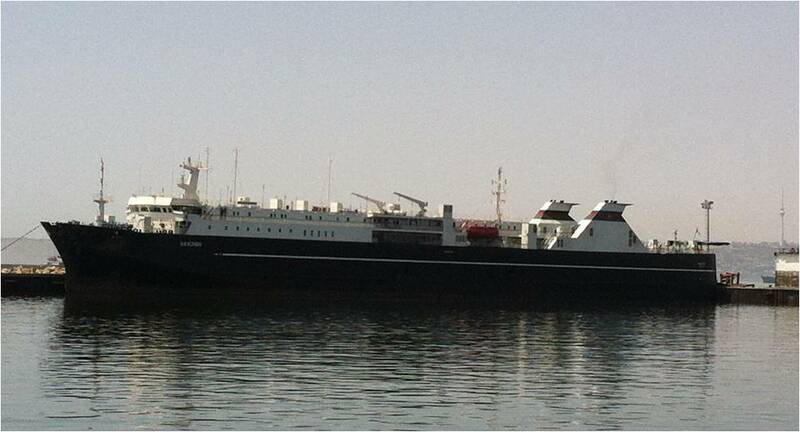 As said, this is a cargo ship, not a ferry. This meant that we had to wait in the harbor for 7 hours on the street at 40 degrees with no food and almost no water to know if there was space enough for non-cargo like us. But we were lucky again! While some of the others were already waiting for more than 5 days hearing the same story from the harbor people every day (80% chance it will leave today, 100% it will leave tomorrow! 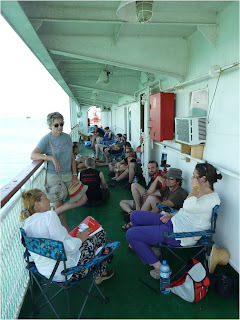 ), the day that we arrived the cargo ship was finally filled up and there was still space for us! July 24th - 18.00 – July 25th 17.00: The Caspian Sea trip. 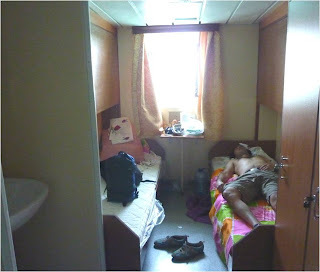 After having heard and read horrendous stories about the ship, it wasn´t that bad. We had a decent little cabin, steaming hot during the day though, which resulted in a cool vibe as all the passengers were sitting around in the 25m2 space of shade on the upper deck. The hardest part was still to come. While we knew the boat trip would be overnight, nobody could tell us if it would be 10 hours or 48 hours. 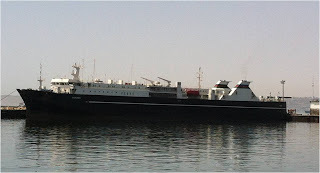 As the harbor of Turkmenistan came into sight, our boat suddenly stopped…there was too much wind to enter the harbor. How long we would have to wait in order for the boat to get closer was unknown. Finally after 3 hours of waiting the captain announced we were going to shore. This however did not meant that we were able to get off the boat. Another two hours passed until we could finally disembark…to again wait another 3 hours in front of the customs. By now, we really started to feel like a bunch of immigrants. July 25th - 17.00 – July 26th 03.00: Amazing bureaucracy. After 35 hours of trip, now we had the best part: police control. 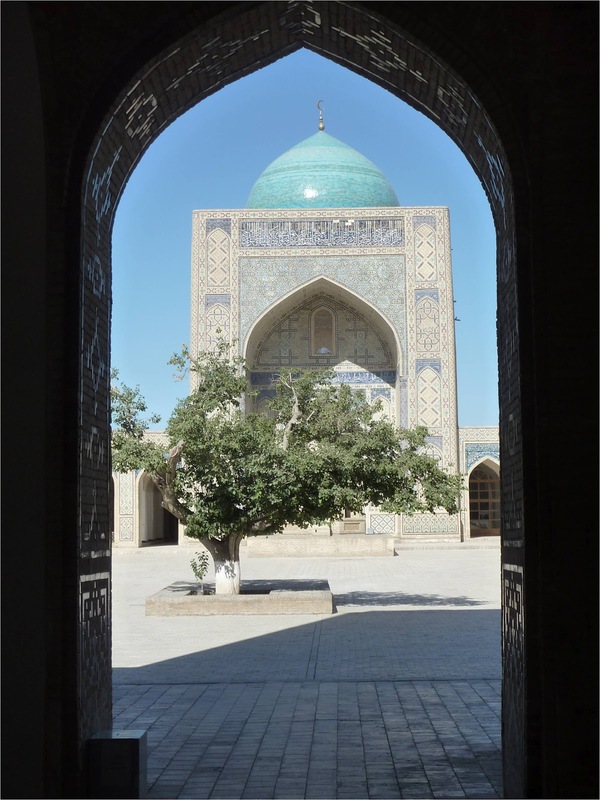 Nobody, we repeat NOBODY that has not been in the police control in Turkmenistan can even imagine what it is like: an unforgettable experience! Everything happened in just one big room with many small desks. We were about 15 Mongol Rally participants and we went from one desk to the other, and back to the first, then to the fourth, back to the second…. filling documents, medical controls, passport controls, stamps, payments, more documents, more stamps, … like this for more than 6 hours!! July 26th 03.00 – 07.00: Resting with the truck drivers. We are taking on this extreme challenge to raise money for the following charities, which help orphaned, abused, and abandoned children in Mongolia. These are the sponsors that are supporting the charity. Do not hesitate and become one of them too!